New publication "Heritage, a driver of development: Rising to the challenge"
ICOMOS is pleased to announce the release of the publication resulting from the International Scientific Symposium held on the occasion of the 17th ICOMOS General Assembly organized by ICOMOS France in Paris in 2011. 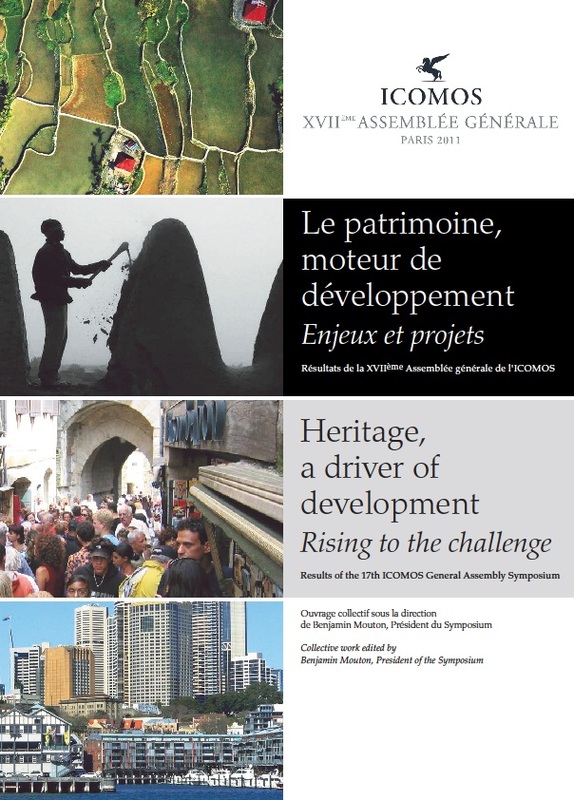 This, fully bilingual, printed volume provides a summary of the issues discussed during the Scientific Symposium “Heritage, driver of development” held at UNESCO, and follows on from the electronic Symposium Proceedings published in 2012 on the ICOMOS and ICOMOS France websites, which are also included as CD-ROM in the new printed publication. The Organization of World Heritage Cities has announced the jury members for the 2013 Jean-Paul L’Allier prize and ICOMOS is proud to be part of it, represented by Ms. Sofia Avgerinou-Kolonias, President of the CIVVIH (ICOMOS International Scientific Committee on Historic Towns and Villages). Happy International Day for Monuments and Sites! In 2013, the theme is Heritage of Education (schools, universities, libraries, academies, etc.) in its expressions in different geo-cultural contexts. In 2013, the theme is the Heritage of Education (schools, universities, libraries, academies, etc.) in its expressions in different geo-cultural contexts. On 4 March 2013, Gustavo Araoz, President of ICOMOS, and Paolo Del Bianco, President of the Fondazione Romualdo Del Bianco - Life Beyond Tourism, signed a Memorandum of Understanding formalizing the collaboration between the two organisations on scientific activities related to heritage conservation and intercultural dialogue. Written on 11 March 2013 . ICOMOS condemns the recent destructions of Sufi cultural heritage in Tunisia and continued threats to this heritage in several countries of the region.